We deleted 27 spam messages. Im confused as a hungry cow on astro turf..what are the lesson we meant to take from this vid? So funny! @zak One of the lessons is that women sitting around discussing men’s beards is as ridiculous as men sitting around discussing headscarves! but i haven’t seen any sheikhs discussing women’s hijab in such a childish and immature way. The message is good, and I agree. But this message could be said in a more humble and serious manner rather than acting it out and being sarcastic. its only fair that girls should be able to do this as men do this to the sisters all the time. Men never follow their hijab and yet speak sincerely to the sisters telling them that they need to follow theirs to the T. Sisters are always being complained at for the way their scarfs look, or that they have a baby hair poking out the top, or their ankles can be seen. The sheikhs always find a way to complain about how women dress and that is what these girls are trying to put across. You should realise, before you complain about this video, that they are only trying to show men what they have to put up with all the time. Personally, i grew up as a muslim girl, and at a very young age i had sheikhs telling me what was wrong with my hijab. Why must we women deal with men telling us that our hijab is wrong, when men rarely ever seem to follow their own. the nature of this video is just to show and to make light of what muslim women deal with daily. As a brother, you should understand this message and support it. As a muslim you should try to follow this message as it explains the problems in your hijab. You cant expect muslim girls not to have a bit of fun with this as theyve had to deal with men all the time telling this to them in a serious manner. You know this is only intended as a joke. I love this. There are so many quotable quotes. I want the kiwi with the hair, sisters!!! Alhumdulalah, Sisters. I lived with the brothers telling me what to do while they did not do themselves for years. No more. Bollywood already made a movie called 3 idiots. Arabs can have their version with these 3 morons! Its so ridiculous the way this is done , totaly goes away from the way of hijaab of a woman its ao cringe , im disturbed at how this is done , i know you mean good sisters but honestly islamicaly the way you do this is just unecceptable , your own hijabs are not fully in order , hijab is not only a dress but also the voice the conduct etc . This is the most stupid video ever. The message was delivered in the wrong manner and it was not clear. I was confused for a while as this is not the way Muslims promote Islamic teachings. These stupid girls sound like they are struggling with the hijab and they don’t like it. If their intention was to sincerely address the issue of male hijab, they could’ve done it in a sincere way just like all the sheikhs sincerely advise the sisters and the brothers as well. 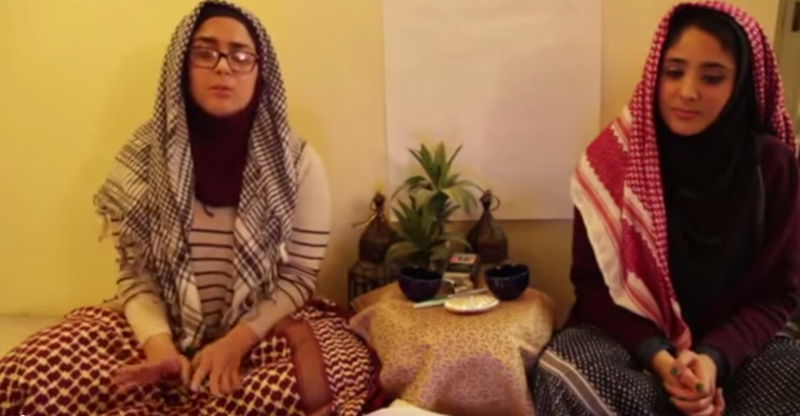 Show me one video where the brothers made sarcastic fun of the sisters who don’t wear hijab. Instead of delivering a sincere message, by using sarcasm, they made fun of Hijab of our sisters, the beard, the modest dressing of the sunnah, fatwas, the teachings of islam and so much more. And they are thinking they are smart and funny by making such a stupid video. Maybe among the donkeys, you’re funny and smart. And btw, beard is not a must and hijab is. Very nice message but delivered in a wrong way!! it’s funny how the negative comments are from men… just so they know, many sheikhs had ‘shildish” and ridiculous video talking about women and their behavour (cheikh gassem for exemple who made a drawing representing how silly women are and how smart men are) the videos made by some cheikhs are really offensive ! Just thank you girls, your vid is really great and using humour to mirror how absurd some cheikhs ! kisses from algeria, sisters! Funny and clever. Well done. Dear girls, as_Salamu ‘alaykunna – this is all all very funny…. or rather almost all, and there is no harm in having fun, and there is also no harm in exposing all the hypocritical bull that certain quarters want to sell for Islam, but if you take the Name of Allah without at least being aware of what your saying …or, even worse, knowingly in an ironic or sarcastic manner … beware He might not find that funny, and if He doesn’t, all the laughs you have caused might turn into tears of acid. May Allah protect you from that! I’m sorry but this is supposed to be humorous? I understand the point of the issue but your attempt is poor and what your indicating is those either w/o a beard or particular styles are already astray. Wrong! Just because one has a beard orwears a hijab does not automatically qualify you as more pious or sincere. Also Islam is not just hijab or beards but extremely broader and these two things do not define Islam. I agree however before men go on about women and hijab they look to themselves first. I think you guys are hilarious. Spot on parody. Please continue the good fight. 🙂 NO DOUBLE STANDARDS ON BODY POLICING & GENDER SHAMING.